So how do you define the place Darjeeling? And if you care to go around the forested land, you can see some amazing animal life like red pandas, pangolins, yellow throated martens, barking deer as well as leopards and even elephants in their natural habitats. And of course if your vacation plan is to relax, enjoy food, do shopping and sightseeing, the friendly natives like the Nepalis, Tibetans and Lepchas will make you feel perfectly at home as you enjoy the fabulous weather and charm of the place. Photo Description: The above photograph was clicked at around 10:00 pm. Quite intriguingly, the photograph seems to be clicked during late dusk. The beautiful peach coloured haze of the night sky gives a divine aura. Did it ever strike you in the first place how the name Darjeeling was coined? Well there are several stories behind the name. The most popular is the one that says that Observatory Hill top (located just behind the Mall) which is the highest point in Darjeeling town, attracted lots of lightning and thunders, particularly during the monsoon season. The word 'Dorji' in Tibetan means 'Thunderbolt' and 'Ling' means 'Place'. Therefore Darjeeling was so named to mean 'The place of thunderbolt'. Another story says that Tibetan monks built a monastery atop the Observatory Hill in 1763. The name of the chief monk of the monastery was Rinzing Dorji Legden La. The Tibetans named the place after him... Dorji-Ling meaning 'Place of Dorji', and hence the name Darjeeling. In Sanskrit, the word "Durjay Ling" means "Shiva of invincible prowess who rules the Himalayas." The name Darjeeling could have also been derived from this. History of Darjeeling dates back to 1700s when it was part of Sikkim under the Raja. It was later taken over by the Gorkhas from Nepal. The Britsh restored Sikkim from the Nepalese in early 1800s and carved Darjeeling out of Sikkim to create a sanitarium (or a health resort) for the British troops and Europeans. But the real development of the area started only in 1866 when Darjeeling made steady progress in the area of agriculture, communication, education and power. Read: History of Darjeeling to know about how a deserted land of mountains and forest became a sprawling health resort for the British and later a top tourist destination. Darjeeling is part of the state of West Bengal in India and located at the northern part of the state. If you are looking for the coordinates (i.e. Latitude and Longitude) of Darjeeling, it is: 27°3'N 88°16'E. Geographically Darjeeling is bounded on its north by the state of Sikkim, on its east by Bhutan and on its west by Nepal. It's standing on a narrow ridge that juts out to the vast basin of the grand Himalayas. From a vantage point in Darjeeling, you get the best views of Himalayan snow peaks towards north and north east. Darjeeling is actually a widespread district although the popular Darjeeling hill town is the nucleus of the place. While the hill town is quite small (about 4 square miles or 10.4 square kilometers), the district spans across some 1,215 square miles of area (i.e. about 3,149 square kilometers including Kalimpong). The district includes the town of Darjeeling, Kurseong subdivision, Mirik and the terai region (lower plains) among other areas. But commonly by 'Darjeeling', one means the Darjeeling hill town. Kalimpong, which was earlier a subdivision of Darjeeling district, has become a separate district of West Bengal effective 14th February 2017 with an area of 1,056 sq kms of its own. The average altitude of Darjeeling Town is 6,710 ft (i.e. about 2,045 meters). While approaching Darjeeling by road or toy train, you will need to cross the highest point of the route at Ghum (7407 ft or 2226 meters). 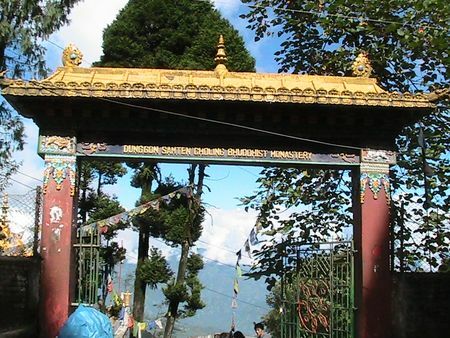 However the highest point or the summit in the whole of Darjeeling district is Sandakphu (close to 12,000 ft) which also happens to be the highest altitude point in the whole of West Bengal. The layout of Darjeeling town can be visualized as three tiers or levels on the hills. And each level is connected to the other by steep narrow roads. Chowrasta Mall which is often known as the Town Center, is located at the top level. The top level is therefore the most coveted area for the tourists. This is where most popular hotels, restaurants and shops are located. You won't get a 3D map of a place, so it may be a bit difficult to comprehend the levels. However in Darjeeling Map, you can see the Mall and the surrounding area. The top level is essentially the whole of Nehru Road which leads up to the Mall, the Mall Road itself, and a part of Gandhi road. Although the area along Zakir Hussain Road which originates from the Mall and goes uphill towards the famous St. Pauls School is also part of the top level, but being further off from the town center, the tourist demand for this area is not as much. There are however several hotels that have come up along Zakir Hussain Road. Many hotels at the top level offer great views of the Kanchenjunga snow peaks. The second level is essentially the area along Laden La Road which goes down and connects the top level with places like station area, Chowk Bazaar etc at the bottom level. Other areas in second level includes the places along HD Lama Road, Robertson Road etc. Here too you will find several popular hotels and shops, but not as expensive as some of those at the top level. In this middle level, you will find many Indian styled hotels and shops, some offering nice views. The lowest level or the bottom level is where the popular Chowk Bazaar or Lower Bazaar is located. The area is always crowded and humming with locals comprising mostly of Nepalese, Tibetans, Lepchas and Bhutias. Towards south the area extends up to the Darjeeling Station and towards north up to North Point (St Joseph's College) and Lebong. You will get several budget hotels in this area although none can actually offer good views of the peaks. From the lowest level you can walk up to the top level, it takes about 30 minutes of tedious uphill walk. Many who come from outside West Bengal wonder if Darjeeling has an airport or a railway station by itself. While Darjeeling does have a small railway station for narrow gauge toy trains, those tiny mountain trains only operate between New Jalpaiguri (located at the plains) and Darjeeling town. Actually New Jalpaiguri (also known as NJP in short) is the nearest major railway junction. Car parking facilities are quite limited in Darjeeling and you can not park your car arbitrarily by the roadside... there will be police harassment and even fines. Some hotels have their own private parking facilities for guests. However most of the public car parkings are located outside the town center. Go through the link above to know about all the free and paid car parking in Darjeeling. The meandering mountain stream Teesta originates from the glaciers and lakes of Sikkim Himalayas and then flows down through Darjeeling, other parts of West Bengal before entering Bangladesh. This section is about the course of Teesta, its main tributaries in Darjeeling district, the best view points along its course, the bridges built over the river and more with great pictures. 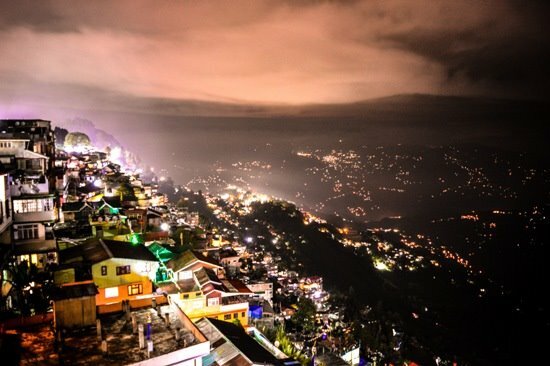 What does the future store for luxury tourism in Darjeeling? Does the hill town that was once well established in the luxury segment way back in the colonial days still hold the same charm and vibe for the high end visitors? Check out the link above for a discussion that was triggered by a viewer of this website. Most who know Darjeeling also know that one of the major constraints the hill town has, is availability of water. And this has been a problem since long. Many budget and even mid-range hotels would caution the guests to use water judiciously. But what is the reason for such perennial water scarcity? Is the capacity of main water storage of Darjeeling enough to meet all demands? Certainly not. Is the water distribution system faulty? Certainly yes and getting worse. Visit the above link to know how the residents and hotels are coping with such water scarcity. Hi Raj, First of all thank you for this informative site. i am a freelancer and have everyday work commitments. I intend to stay up there in the hills for sometime, I would like to know if I avail all my internet arrangements (jio wifi connection), would i still be able to manage network in this region ? thank you !! Hi, yes JIO, Vodafone, airtel, bsnl etc work in Darjeeling town (but may not work in outskirts or remote areas). Networks are mostly 3G and may be patchy at times. Hi Raj, This website is really helpful. I am planning to visit Darjeeling again on 23rd of October 2015 (the day after Dussehra). I know during puja time there will be a mad rush in Darjeeling. But will it be same after Dussehra? I do not have any idea when the puja holiday ends. Do you recommend visiting Darjeeling that time (right after puja). Many thanks. Rush usually continues till Dewali (in November). I belong to a small group of senior citizens who want to experience the best of flora & fauna as well as the clearest view of the Himalayas as possible at the titled location(s). I shall be deeply obliged if you let us know the month in which it would be possible to have the best of both (i.e. views of the Everest & Kanchenjunga ranges, and the forests & flowers). April is a good time to get best of all.